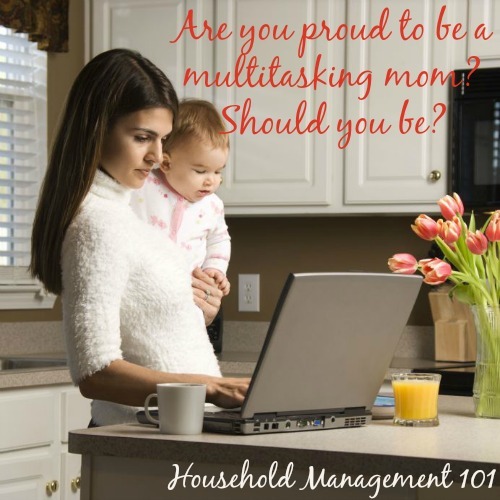 Are You Proud To Be A Multitasking Mom? Should You Be? 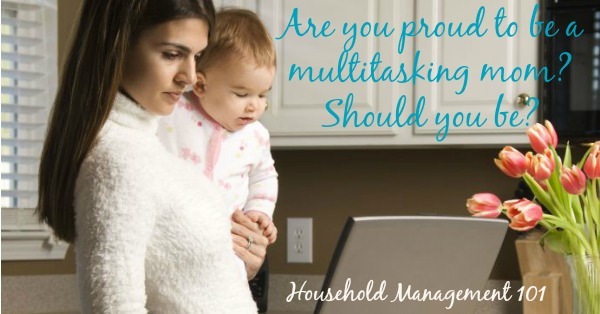 Are You Proud To Be A Multitasking Mom? Are you proud to be a multitasking Mom? It seems like many people are these days. For instance, in a recent issue of Star Magazine (I know, I read trash, but its fun!) Katie Holmes said, "I'm a mother. So you get used to sort of doing so much at once -- multitasking." She says this like it is a badge of honor, but is it? I have been thinking about this for a while, since I read the book The Myth of Multitasking , by Dave Crenshaw. The rest of the title of this book states, "How 'Doing It All' Gets Nothing Done." The book got me thinking about whether when I multitask I actually do get lots done, like I think I do, or if I am just swirling around getting nothing done. The book makes a pretty convincing argument that you get nothing done. I resisted this conclusion though for a while, because I was so proud to be a multitasking Mom. However, after much thought and some experimentation I have come to the conclusion that multitasking is not good for anyone, especially mothers, to do. The whole premise of The Myth of Multitasking is that our brains cannot actually multitask, so we don't actually do two things at once, but instead switch back and forth rapidly between the two. When you switch back and forth you have to remember what you were doing, where you were at in the project, what you planned to do next, etc., and incur what is termed "switching costs." These are costs where you waste time recalling all these things and are actually not accomplishing anything. Then, as soon as you remember and get back in the groove you switch again, thus incurring even more switching costs. It is basically a very bad cycle. Therefore, instead of calling it multitasking Crenshaw says we should call it what it really is, "switchtasking." When reading all this I kept saying to myself, but I can listen to the radio while folding laundry -- so I am a multitasking Mom! My bubble was soon popped though while reading the book, because this activity is a prime example of what is termed "background tasking." Background tasking is where you perform two activities, but only one requires mental exertion. In my example listening to the radio takes little mental effort, and folding laundry hardly takes any either, although slightly more. No wonder I can do both at once! Well, I thought, even if I'm no good at multitasking it doesn't hurt anyone else, because I am just wasting my own time, right? No, wrong. This is where I really had to accept that multitasking is not ideal for mothers, especially. The quotes about multitasking that Crenshaw has sprinkled throughout the book seem amusing or funny at first, but it made me think about the high personal and familial cost of multitasking. I know, myself, that I have been guilty of focusing on another task while I am also trying to talk to one of my kids, and I really haven't heard what they said. It made me realize that multitasking can be damaging to relationships, because we are not giving our full and complete attention to the people who are the most important in our lives, our family. Even more than not actually getting as much done as I thought I was, this reason of not hurting my relationship with my kids and husband has convinced me I shouldn't be a multitasking Mom. Those of us who have kids, jobs, pets, husbands, hobbies, and/or friends (not necessarily all in that order) know that life can be crazy and busy. So basically, really, whether you have kids or not, really life can be too busy sometimes. I had chosen to be a multitasking Mom so I could try to get everything done that was needed. After all, when you have children your life can become loosely controlled chaos. From my many discussions with other mothers I know that many of you feel the same way. This is confirmed by The Myth of Multitasking book. The book focuses on business, but as household managers we too are like the CEO of our house. It confirms that "the more responsibility you have, the more hats you wear, the more likely you are to become inefficient." Wearing lots of different hats and having lots of responsibility are two key parts of being a household manager! Therefore, I have to say at first I was a bit discouraged by the concept of not multitasking, because our jobs as household managers seem to call for such switchtasking on a constant basis. That's what I have been thinking about for months now. Here are my conclusions on how to minimize switchtasking, focus on our families properly, and still get something done! So, what should we do to avoid the perils and inefficiencies of being a multitasking Mom, but still get something done? Create schedules, habits and routines to get tasks accomplished, like your cleaning, cooking, and other tasks around the house. 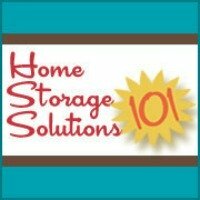 Make sure these routines and schedules take into consideration the anticipated needs of your kids and home. A lot of the interruptions of my time, for example, are for basic needs for the kids. When I routinely schedule these basic needs, such as regular diaper changes, snacks and food, baths, toy change outs, etc., I avoid a lot of interruptions. In addition, kids begin to anticipate the routine, and don't have to interrupt for something they know is coming in a couple of minutes anyway. Obviously, this does not stop emergencies from happening periodically, but clearly you can't stop those anyway. Further, accept help from others. You don't have to do everything yourself. Get a mother's helper, have your husband pitch in, assign the kids chores, etc. Schedule time to spend with each family member, consistenly, so they feel like they have time to talk to you, cuddle, or whatever they need emotionally, and they will not be so anxious to interrupt what you are doing at other times. Do certain things that are important to you before or after the kids go to sleep. I know many mothers who feel devotional time is so important to them that they get up early, before the kids, to get that time in. I know many others feel the same way about exercise, for example. Finally, anticipate interruptions. If these interruptions are not ones you can avoid by anticipating needs before hand, just schedule them into your day. Then, they are not interruptions, but instead moments you know are dedicated to dealing with your kids or your home. Then, you can truly give them the focus they deserve. OK, I am out of ideas, at least currently. I would love to hear your ideas, thoughts, and strategies for avoiding being a multitasking Mom, so you can get something done and still enjoy your family.